This park is located in Jung-gu, Busan. It is said to be one of the 3 popular mountains in Busan. Earlier it was known as Songhyunsan, which means a mountain having a view of the beautiful sea through its dense pine forest. Later the name was changed to Youngdusan, where Yongdu means dragon’s head. It is said that the mountain park looks like a dragon head. Exhibition Hall of World Model Boats – It contains 80 models of traditional Korean yellow-hemp sailboats, turtle ships, luxury cruise ships and classy warships. Also, visit the popular attractions in the city by following Busan itinerary 1 day. 50 Parking space is available only for vehicle carrying disabled people, tour buses carrying at least 12 tourists and cars carrying nationals. For disabled – elevator, wheelchair lift and restrooms are available. World Music Instruments Museum is closed on Mondays. Traditional arts performance is held on every Saturday (March – November) from 3pm onwards. Sky lounge is there ( for coffee and other beverages). For Observatory, Adults (above 16): 4,000won (personal), 3,500won (in group of 20 or more). Children (under16) and seniors: 3,500 won (personal), 3,000 won (in group of 20 or more). For The Museum of Musical Instruments of the World: Adults (above 16) – 2,500won (personal), 2,000won (in group of 20 or more). Children (under16) and seniors: 2,000 won (personal), 1,500 won (in group of 20 or more). Integrated tickets – Observatory and Museum: Adults (above 16) – 5,000won (personal), 4,000won (in group of 20 or more). Children (under16) and seniors: 4,500 won (personal), 3,500 won (in group of 20 or more). Opening hours for Busan Tower Observatory: 9.00 am – 10.00 pm (October – March) and 8.30 am – 10.00 pm (April – September). Ticket office closes at 9:45 pm. World Music Instruments Museum – 10:00 am – 6:00 pm. How popular is Yongdusan Park? People normally club together Haeundae Beach and Haedong Yonggungsa Temple while planning their visit to Yongdusan Park. Fresh air, beautiful view, it's in the hill higher from Busan city. I haven't tried to go up the Tower, but the view here is amazing and it's near night market. Felt completely unsafe my entire time here. Absolutely terrible experience. Visited on NYE for a bell ringing ceremony, and they let in way too many people. Spent over half an hour packed in with literally no space on any side of me, being pushed against a wall from the side, from behind by people still trying to climb up, and from the front by people trying to get down...all while occasionally being knocked on the head by people's elbows and feet hanging off of the railing above me. Most of the people within about 10-20 feet of me (at least) couldn't see any of the celebration at midnight. Then for about 15 minutes, I remained unable to move up or down, while police or security told people to get off the guardrail above. After about 5 minutes, most people were moving down, and I followed the flow of the hundreds/thousands of people. Around 12:25, they started a fireworks display. I tried to make my way back up to see some of it, trying to salvage the ceremony, but my view was blocked by trees for the entire 30 second duration of the show. The worst part is, I would have had a better view of the ceremony, the countdown, and the fireworks display if I had just stayed outside the park and never got into the line to enter in the first place. They let in WAY too many people, and it seemed like it could have been a stampede disaster if anything happened. "I have to be careful not to die here" is not what I want to be thinking as a new year begins, but that's how it went here. Beautiful place with beautiful view. You can also take a walk down the stairs and end up at one of the shopping districts. Walk round and around the park uphill in the evening after your meal. Good exercise and then good view of the city. 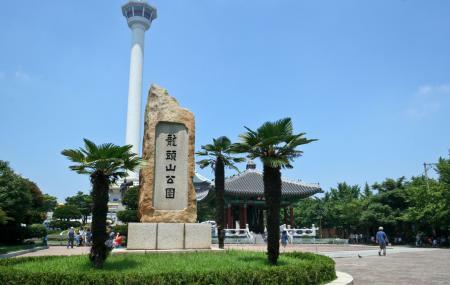 You can visit Busan Tower In Yongdusan Park. Beautiful view from Busan Tower. Better than N Seoul Tower for me.